I look back on the early 1990s and remember liking California Pinot Noir practically labeled me an eccentric. To most wine lovers of the time, Pinot Noir was an afterthought, a weak substitute for Cabernet Sauvignon and Merlot. For me, Pinot Noir was the Holy Grail, the most sensual of all wines, and I was staunchly determined to pursue my love affair with it. 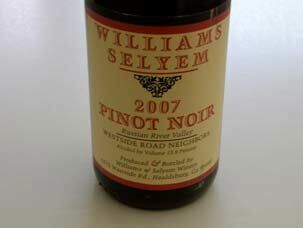 It was the Pinot Noirs of Williams Selyem that culminated my courtship. Burt Williams and Ed Selyem were able to produce magical Pinot Noirs out of a small garage on Fulton Road in Santa Rosa. The original Pinot Noir garagistes, they crafted magical wines from vineyards that are now revered like Rochioli, Allen, Hirsch and Olivet Lane. It was a 1992 Williams Selyem Rochioli Vineyard Pinot Noir that made such a powerful impression on me that even today I can taste the wine, and clearly believe it was the greatest California Pinot Noir I have ever had in my life. Burt Williams lived in Forestville, worked as a printer for the San Francisco Newspaper Agency (the Chronicle and Examiner), and made wine at home. Ed Selyem was a wine buyer and salesperson who crafted beer and fruit wine in his garage in Forestville. Together, they began making wine from Sonoma Zinfandel grapes for their own use in 1979. They started making wine commercially in 1981 at Russian River Valley Vineyards in Forestville and bottled the Pinot Noirs under the Hacienda del Rio label, a name Ed used on his first home-crafted wines. 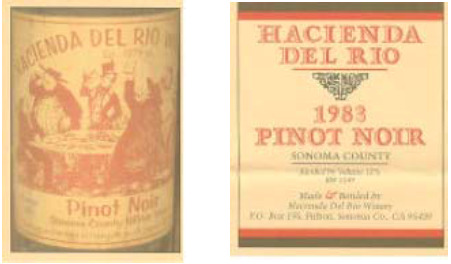 The photo below on the left shows a 1980 Hacienda del Rio label from a wine produced in Burt's Forestville garage but not released commercially. The 1981 to 1983 Hacienda Del Rio label looked exactly like the current Williams Selyem label, using the same letterpress letters, color and paper (below right). A complaint from Hacienda Winery prompted the partners to drop the original name and substitute Williams Selyem beginning with the 1984 vintage. In 1984 they had moved to a rented garage on River Road in Fulton, becoming true "garagistes." Williams was a burly vintner who had a superb palate and an uncanny and self-taught sense of how Pinot Noir should be vinified (photo below left). He never set foot in Burgundy. Early on, production methods were old fashion and labor intensive due to a lack of capital. In the early years, Williams continued his job in San Francisco as did Ed at Speer’s Market in Forestville, and they took vacations at crush time to make the wines. They began with little money, never borrowed, and grew 25% every year by starting small and plowing all of their income back into the business. Spouses Gayle Selyem and Jan Williams were also partners in the winery which early on hired no outside help. It was a perfect business partnership with Burt driven to make world-class wine and Ed determined to create a successful business from local agriculture. Burt preferred colorful sport shirts with suspenders, Ed opted for tee shirts and boots. Both lived simply and shunned publicity. There was never a sign at the garage announcing the winery’s location, and there was never a tasting room. The secret to their success, and this has become the model for all prestigious producers of California Pinot Noir today, was to carefully chose their grape sources and perform all the work in the winery themselves. Over time, North American vintners have come to realize that Pinot Noir requires delicate handling and constant vigilance in the winery, two things Ed and Burt practiced from the beginning. Their winemaking techniques were very labor intensive, but the result justified the effort. 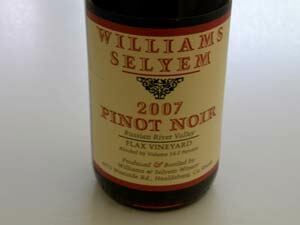 The Williams Selyem Pinot Noir were brimming with varietal character, and although light in color, they had superb aromatic and flavor intensity. The more wine Williams Selyem made, the more favorable the press that followed, causing a snowball effect in demand. 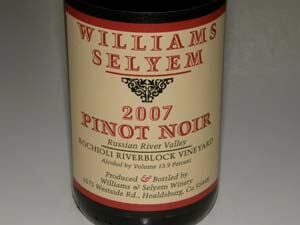 The 1985 Williams Selyem Rochioli Vineyard Russian River Valley Pinot Noir became the most seminal wine in the history of California Pinot Noir. This wine won the Sweepstakes at the California State Fair Wine Competition, voted the best of the 2,136 wines entered by 416 wineries in 1987. 295 cases of this wine were produced and it sold for $16 a bottle. 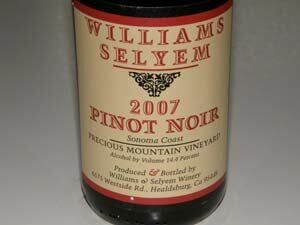 Williams Selyem Pinot Noirs were amazingly fruity and complex when young and seemed to age better than most California Pinot Noirs of the time. The wines peaked around 6 to 7 years after release, but it was difficult to avoid drinking them young. The unlikely owners and the scarcity of their wines created a mystique, but it was the wines’ quality and consistency that was the attraction. Win Wilson and Jack Daniels, the Napa Valley importers of Domaine de la Romanee-Conti came calling to Williams Selyem in 1992. They wanted to compare wines. 22 wines and 5 hours later, no conclusions were publicly reported, but the reason to do such a comparative tasting indicated the cachet that Williams Selyem had gained with the wine industry. 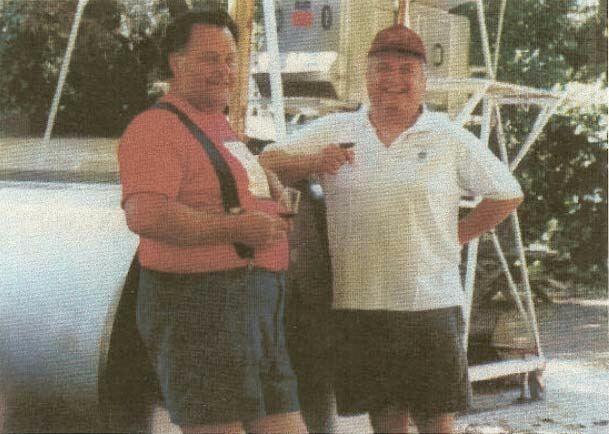 The popularity of Williams Selyem wines took its toil over the years on Ed and Burt. Managing the mailing list and the hoards of wine enthusiasts trying to get on the list became a daunting task. Two of the winery’s seven full-time employees in the mid 1990s were designated as “keepers of the list,” and devoted their work day to managing it. The partnership slowly developed some rife and Williams Selyem was put on the market in 1997. It was sold to John Dyson, a long time member of the Williams Selyem mailing list in 1998 for a reported $9.5 million. The official word was that Ed developed serious back problems from lifting cases of wine over the years, but the reasons had to be more complicated, yet were never divulged. The last vintage that Ed and Burt vinified at Williams Selyem was 1997, with Burt consulting on the 1998 vintage. At the time the winery was sold, there were 10,000 customers on the mailing list and many more on the waiting list. John Dyson, a wealthy New York politician, was a former New York State agriculture commissioner and a former deputy mayor under Mayor Rudy Giuliani. He owns Millbrook Vineyards in upstate New York and Villa Pillo Estate in Tuscany as well as Mistral and Vista Verde vineyards on the Central Coast of California. Dyson essentially paid a fortune for the Williams Selyem name only since Ed and Burt did not own vineyards or a physical winery. Dyson lost some of the hand shake agreements that existed for grapes from Olivet Lane Vineyard, Summa Vineyard, and Rochioli’s West Block, but several of the vineyard sources such as Allen Vineyard, Ferrington Vineyard and Hirsch Vineyard were retained. Upon purchasing the winery, Dyson hired the relatively unknown winemaker, Bob Cabral. Cabral, who was Williams Selyem customer number 576 on the mailing list, was the son of grape farmers. He had earned a degree in enology at California State University at Fresno and learned his trade at DeLoach Vineyards, Knude, Alderbrook, and Hartford Court. Since assuming winemaking responsibilities, Cabral has followed many of Williams’ winemaking methods. After an inauspicious start (it is always difficult to follow a legend), he is producing an exceptional lineup of appellation-based and vineyard-designated Pinot Noirs that are still eagerly sought after. The wines are now a little higher in alcohol, deeper in color, and offer more intense fruit-driven flavors, but they have received consistent praise from the wine press and the winery continues the tradition of excellence began almost thirty years ago. Finishing touches are being applied to the new Williams Selyem production facility at the Litton Estate on Westside Road. Crush activities still take place at the nearby Allen Ranch but the production barrel rooms that are built into the hillside are finished and the bottling line was in place for the 2008 vintage. Solar panels supply much of the winery’s electric power and rooftop gardens help insulate the new building. 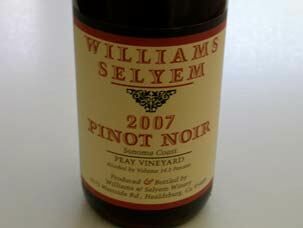 I recently tasted through most of the lineup of the 2007 Williams Selyem Pinot Noirs. These wines have now spent some reasonable time in the bottle allowing for proper critical evaluation. The wines met all of my preconceived expectations considering the accolades bestowed on the 2007 vintage, This vintage was recently declared “Vintage of the Decade” by Wine Enthusiast magazine, whose Pinot Noir wine reviewer, Steve Heimoff, awarded the 2007 Williams Selyem Litton Estate Vineyard Russian River Valley Pinot Noir ($100) a score of 100, matching its price, becoming the first California Pinot Noir ever given such a lofty score. The 2007 growing season in California was marked by moderation and evenness. Bud break was uneventful in March, the summer was warm and sunny with very few heat spikes resulting in uniform ripening. The harvest of Pinot Noir began in early September and was interrupted by fog and cool weather in the middle of the month, followed by a leisurely paced harvest of the rest of the crop which benefited from the extended hang time. According to Williams Selyem,”In a decade of exceptional vintages, this one really stands above all others.” I did not review the Litton Estate Pinot Noir from a winery-owned 19-acre vineyard or the Central Coast, Sonoma Coast and Sonoma County bottlings. The wines were all darkly colored with admirable balance, excellent integration of oak, and appealing aromatics. They are solid wines, and while several stir emotion, a few don’t deliver at the price point. 14.1% alc., $45. Primarily sourced from the winery’s Drake Estate Vineyard planted in 1998. Pommard and Dijon 115. · Heady aromas of Bing cherries, cola and baking spice. Reasonably concentrated flavors of dark red cherry and berry fruit which build in intensity in the glass. Very pleasing in the mouth with soft tannins and a crisp finish. Very good. 13.9% alc., $54. · Marvelous spiced Bing cherry aromas predict greatness but the wine deliver flavors with a disappointing message. The cherry core is dominated by an earthy, savory, woody imprint that just wasn’t to my liking. Decent. 14.2% alc., $54. · A signature Russian River Valley Pinot nose perfumed with nicely spiced berry and cherry compote with an echo of oak. Very tasty panoply of red berries and cherries intensely composed like a flavorful liquor. Juicy with a smooth viscous mouth feel, supple tannins and perfect balance. A great wine that reminds me of old vintages of Williams Selyem and one of my favorites in this lineup. 13.9% alc., $54. · This wine offers an interesting array of scents including fresh berries, black currants, vanillin oak and stem. Moderately rich middle palate of cherry and berry fruit with a hint of citrus bringing up the rear. Bright and juicy with moderate persistence on the finish. Solid but not spectacular. Very good in this vintage. 14.3% alc., $56. · This wine takes on more muscle and interest with time in the glass. The nuanced aromatic profile features dark stone fruits, spice, oak and toast. Deep, dark but charming fruit is wrapped in firm tannins and balanced acidity. A virile wine of great intensity that has multiple layers of fruit and perfect harmony. 13.9% alc., $62. · Simple perfume of crushed cherries, berries and sweet oak. A rich, full-bodied and tasty fruit-driven wine with a little acidic tang on the finish. The tannins are reigned in creating a silky drinking experience. A bit one-dimensional but the sappy fruit flavors will find many fans. Very good. 14.3% alc., $69. · Very dark reddish-purple color in the glass. Intense aromas of blackberries, black plums, Indian spices, loamy earth and green garden with a hint of alcohol peaking out. Unctuous, tannic, rough hewn and muscular on the attack featuring smoky dark fruits and a citrus underpinning. Needs food, preferably short ribs. Decent. 14.3% alc., $72. · Starts off strong in the glass with alluring floral and red berry scents, fading over time revealing more savory, earthy accents. Delicious and generous lasting flavors of deep red cherries and berries pulled into line with fine grain tannins and bright acidity revealing itself in a citric peel highlighted finish. Not a huge or loud wine, but very satisfying. Very good. 13.9% alc., $75. · Very alluring scents of cardamon spice, rose petals and Bing cherries. An impressive wine with a discreetly concentrated cherry and berry core augmented with Xmas spice, vanilla and an undertone of minerality. The silky texture is dreamy and the overall impression is one of purity, vibrancy and harmony. This is clearly the class of the lineup and will definitely find a place on my 2010 All American team. 13.8% alc., $78. · Subdued aromas of wild berries and plums. Earth-laden dark fruits with a hint of tea and root beer. Rich and husky but not showing much chutzpah now. Smoothly textured and well-crafted but dull. I expect more from this bottling and perhaps it will improve with time in the cellar. I didn’t have a second bottle to sample. Decent (+). 14.4% alc., $90. · Delicate aromas of dark stone fruits and blackberries. A hulk of a wine with prodigious dark fruit that coats the mouth with intensity. A wonderful sipping wine that will charm any big fruit lover. Hard to keep you hands off now, but cellaring will provide dividends down the road. This wine definitely stands out from the pack. 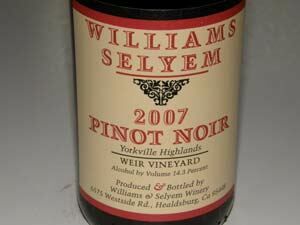 Williams Selyem wines are primarily sold to an eager and faithful mailing list of customers. With the recent economic downturn, some of the wines have been more available to those not on the mailing list (inquire by phoning the winery). The wines are readily available on the secondary market at a small premium over the release price. There are two offerings. The spring offering brings primarily the appellation Pinot Noirs and Westside Neighbors bottling while the fall offering includes all the single-vineyard Pinot Noirs. High quality Chardonnay and Zinfandel are also produced. The informative website is at www.williamsselyem.com. Maps of all the sourced vineyards are included. Videos of Russian River Valley pioneers are also offered including interviews with Howard Allen, Helen and Charles Bacigalupi, Jim and Andrew Forchini, and Joe Rochioli. The James Beard winning video on the Russian River Valley produced by Grape Radio is also available for viewing.